This recipe is perfect to nourish on cold winter mornings. We made this using our Musui-Kamado (a Japanese slow cooker) available here. It can easily be made on a stovetop or in other slow cookers. The fruit can be substituted for any seasonal ones: grapefruit, berries, pears, etc. And the grains can also be interchanged — these two happen to require similar cooking time and so they pair well. Heat the Musui-Kamado (or a regular medium sized pot) to medium heat and combine buckwheat, oats, coconut milk and salt. Set the timer to 30 minutes (or cook on medium heat for 25-30 minutes) Cover and bring to a boil. Remove cover and reduce heat to low. Stir every few minutes. Right before serving make the blood orange compote: heat butter in a small skillet, add orange segments and sugar and cook for 2 minutes until slightly softened. 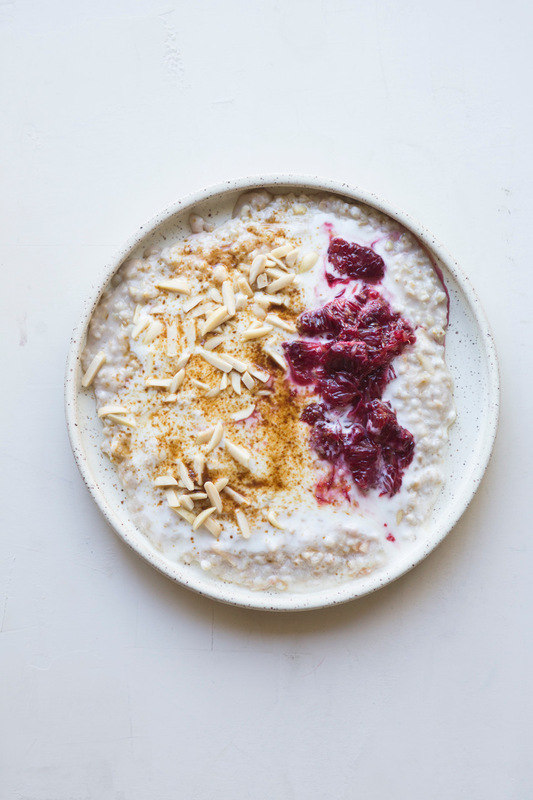 Serve porridge with a generous amount of yogurt, a spoonful of the compote, slivered almonds and coconut sugar. Note: If you prefer a thicker porridge you may want to reduce milk quantity to 3 cups.